So you love blogging? If you are reading this, then chances are you are a regular blogger. But blogging using the default web interface provided by the blogging services and tools like WordPress and Blogger is not always a pleasant task. That is where the desktop blog editors come in. With a desktop blog editor you have the familiar interface of your favorite document editor; you can write posts offline, and even change the settings of your blog, among many other benefits. So let’s take a look at some of the best desktop blog editors for windows. Scribefire is a Firefox extension which makes it possible to post to your blog from within Firefox. It supports many blogging services and tools including WordPress, LiveJournal, Xanga, Windows Live Spaces, Performancing, MySpace, Tumblr, Movable Type, Drupal and Blogger. Scribefire has a very user friendly interface that can be opened as a new tab, a new window or it can just share space with the browser window by splitting the screen. You can view your blog entries, categories in the sidebar, and it also lets you share your blog post on sites like Digg, Fark, and Reddit etc. from within Scribefire. Other features include uploading images, posting as draft, setting timestamps etc. 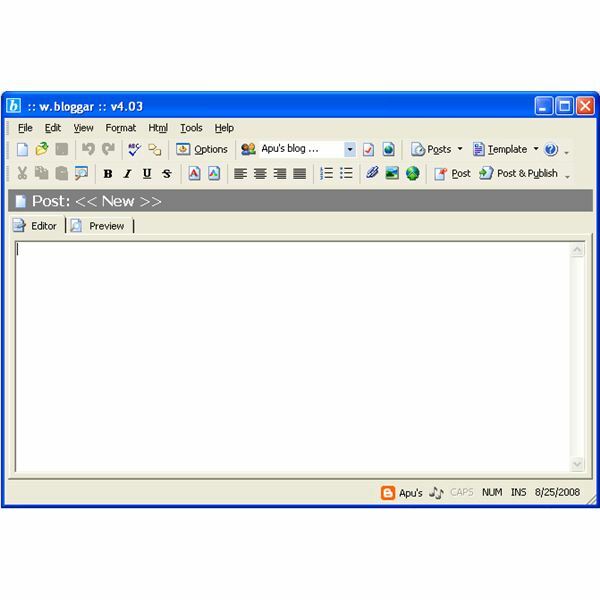 w.bloggar is a simple blog editor which works with many different blogging services and tools including Blogger, MSN Spaces, TypePad, BlogWare,DearDiary.Net, MovableType, WordPress, Drupal, LiveJournal, Xoops, blojsom etc. It has a preview mode which lets you preview your posts before submitting. Adding a blog account is very easy with the ‘Add Account’ wizard. It also has a portable version which you can carry in your USB drive. Qumana has a simple and user friendly interface. The left side bar lists all your blogs and the main pane lists the recent posts of the selected blog. The pane below it displays the content of the selected post. Clicking on ‘New post’ opens the post editor in a new window. The post editor has common formatting options and also lets you decide on some settings, like whether or not to allow comments, etc. Blogwriter supports a wide range of blogging platforms including WordPress, Blogger, Drupal, LiveJournal, Windows Live Spaces etc.. It has a simple interface with two panes. The left sidebar lists your posts, links, images and tags. The posts editor opens up in a new window and lets you create your posts and tag them right from your desktop. Post2Blog is a free blog editor with a What You See Is What You Get (WYSIWYG) editor. It can automatically upload images to Flickr and Imageshack. It installs an Add-In for MS Word which lets you blog from within MS word by using the Post2Blog word toolbar. It can also automatically send trackbacks and ping web services. Setting up your blog in BlogJet is very easy and it supports almost all the common blogging platforms including WordPress, TypePad, Movable Type, Blogger, MSN Live Spaces, Blogware, BlogHarbor, Drupal etc. Its interface is very simple with two panes, one for editing your posts, and from the right sidebar you can add tags or set the time stamp. It makes it easier for you to insert a Youtube video or Flickr image by providing quick access to them. There is a live word counter and a spell checker among other useful features. Bleezer supports Blogger, Movable Type, Drupal, Blosjom, Roller, Typepad, WordPress, etc. It has a somewhat advanced interface which has all the basic formatting options and lets you view your posts in the html and preview mode. You can also tag your posts and insert links or images. It features a spell checker.